A Loyalist House was likely to be seized and sold when the American Revolution broke out. Many colonies passed laws that let them confiscate the property of known Loyalists, criminalizing dissent against the war and raising revenue for the war effort. Many Loyalists fled to Canada or England. The British government compensated some for their loss, but tried to pressure the United States into giving restitution. Under the Jay Treaty of 1794, the U.S. agreed to ‘advise’ the states to return Loyalist property. Some families are still trying to get their property back. Connecticut was more lenient than the other New England states in confiscating Loyalist houses. It waited until four other states had passed confiscation laws, and local officials dragged their feet in identifying Loyalist properties. Vermont, on the other hand, was eager to seize Loyalist property in order to pay for the Green Mountain Boys. Here, then, are stories of six Loyalist houses and their fate during the American Revolution. If you know of a Loyalist house that should be imcluded, please mention it in the cpmments section. A Loyalist house in Connecticut, owned by Joseph Pynchon on the eve of the Revolution. When Joseph Pynchon purchased the Henry Whitfield House in Guilford, Conn., he was supposedly seeking a relaxing summer retreat. His timing was not good. The Whitfield House, built in 1639, has the distinction of being the oldest house still standing in Connecticut. The structure was built by Henry Whitfield, one of Guilford's founders, before there was even a town in Guilford. Its stone walls helped it serve as a garrison for townspeople. It would later become an investment property for a wealthy English landlord who rented it to tenant farmers. 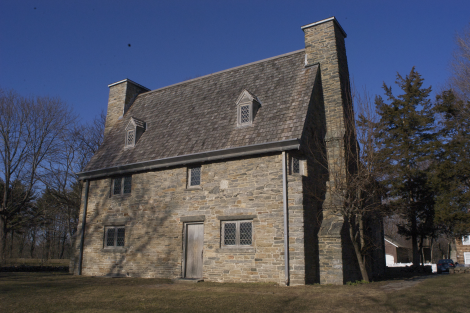 Pynchon bought the house in November of 1772. Originally from Springfield, Mass., Pynchon inherited substantial wealth. He had Loyalist political sympathies. He also joined the Sandimonians in New Haven, an obscure religious group that originated in Scotland. Not only was he a Loyalist, the Sandimonians were pacifists, giving Pynchon's Patriot-leaning neighbors two reasons to be suspicious of him. Fearing persecution, Pynchon sold the Guilford house just a week before the Declaration of Independence was signed, and he spent much of the war in exile under British protection. He returned to Connecticut when the danger cleared and Loyalists were allowed to reestablish ties to their homeland. Among Pynchon's descendants was Thomas Pynchon, one-time president of Trinity College, and novelist Thomas Pynchon. As for his summer house, today it has left the family that bought it from Pynchon and is now a museum. William Pepperrell led the Siege of Louisbourg during King George’s War in 1745, but his house in Kittery, Maine, predates that heroic maneuver by 63 years. Pepperrell was the son of William Pepperrell, a fisherman who had lived and prospered on the Isles of Shoals before moving to the mainland in 1680. The senior Pepperrell married the daughter of John Bray, a wealthy shipwright, and went into business with his father-in-law. Soon Pepperrell was one of the richest men in New England and owned most of Kittery Point. The junior William Pepperrell was born in the house in 1696. He joined his father in business and continued the family's rise by marrying the granddaughter of Samuel Sewall, one of the Salem witch trials judges. Pepperrell joined the Massachusetts militia and rose to colonel. It was he who assembled volunteer soldiers for capturing the Fortress at Louisbourg, trained them and financed the expedition. After the fortress fell, King George II awarded him a baronetcy. Pepperrell served as acting governor of Massachusetts in 1757 and died two years later. His grandson, born William Pepperrell Sparhawk, inherited the house after agreeing to change his name to William Pepperrell. The third William Pepperrell remained loyal to the English king on the eve of the American Revolution. He fled to England with his wife, who died of smallpox on the way in Halifax, Nova Scotia. Pepperrell died in London. 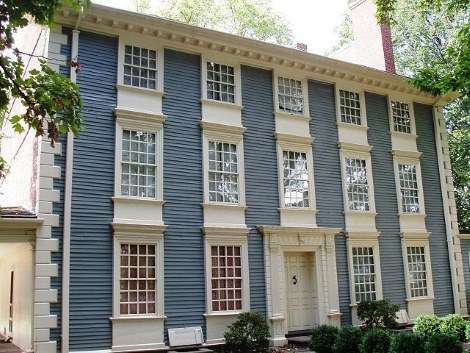 Massachusetts deemed the house Loyalist property and put it up for auction. In 1790 the house was purchased by Col. Samuel Smallcorn, and Daniel Frisbee bought some of the property. In 1973 the Pepperrell House was listed on the National Register of Historic Places. It is privately owned. The Isaac Royall House in Medford, Mass., is the only house in New England that still has slave quarters. The Royalls had the largest number of enslaved people in New England during the 18th century. Inside the house is a tea box, said to be among the batch thrown into Boston Harbor during the Boston Tea Party. Puritan leader John Winthrop built the first house on the property along the Mystic River in 1637. It became Charlestown and later Medford. A second house on the property was purchased with 504 acres in 1732 by Isaac Royall, a rum distiller and slave trader from Antigua. He brought 27 slaves with him to Massachusetts. 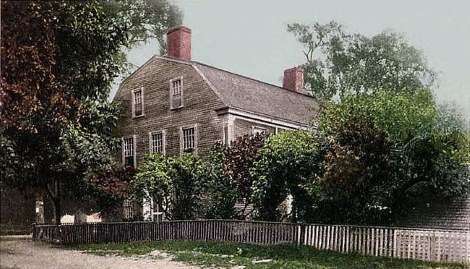 Royall enlarged and remodeled the house between 1733 and 1737, then died in 1739. Isaac Royall, Jr., inherited the house on his father’s death. He again expanded the house. He and his family were Loyalists who boarded a ship in Boston as British soldiers marched to the Battles of Lexington and Concord in 1775. They sailed to Nova Scotia and then to England, never returning. Gen. John Stark made the house his headquarters after Massachusetts confiscated the estate. It was said his wife Molly watched British troop movements from the roof, and George Washington interrogated two British soldiers in the Marble Chamber. In 1806, the estate was returned to Isaac Royall’s heirs, who sold it and gave part of the proceeds to Harvard, which used it to found Harvard Law School. A local chapter of the Daughters of the American Revolution bought the house in 1908 and turned it into a Loyalist house museum. The Isaac Royall House and Slave Quarters is open to the public for tours on weekends from June through October. 15 George St., Medford, Mass. 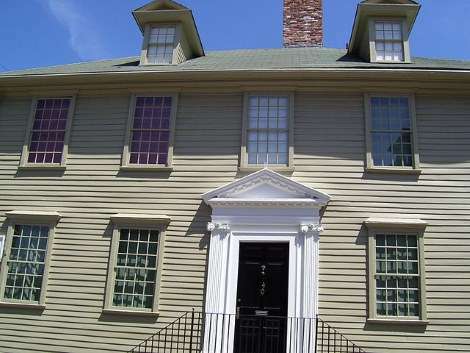 Henry Appleton, a merchant, built the Mark Wentworth House in Portsmouth, N.H., in 1763. He sold it the next year to Mark Hunking Wentworth, brother of Royal Gov. Benning Wentworth. Mark Wentworth’s son John was born in 1737 and attended Harvard with John Adams, with whom he became a close friend. John Wentworth II, however, remained loyal to the king. In 1763, John Wentworth was sent to London on family business. Uncle Benning had been busy selling land grants in Vermont, but the Lords of Trade awarded the province to New York. They were on the verge of recalling Benning Wentworth when John II intervened, so they gave him the governorship. John Wentworth returned to New Hampshire amidst pomp and ceremony in 1767, and moved into his father’s house. He complained about its small rooms. He served as a popular and able governor until resistance hardened to King George III. When a mob pointed a cannon at his front door in June 1775, John Wentworth and his family fled to the safety of Fort William and Mary. He sailed to Boston about a month later and sent his family on to England. On Evacuation Day he left for Halifax. The New Hampshire government seized the Loyalist house, but saved the furniture and portraits for the family. In 1797 the house was sold, but 13 years later Ebenezer Wentworth bought it back. In 1911 Dr. Charles Wentworth and his sister Susan converted the house into a nursing home. It is now Wentworth Senior Living. 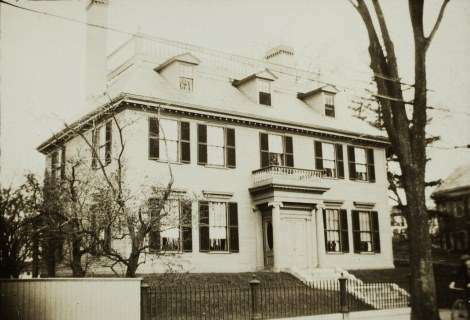 346 Pleasant St., Portsmouth, N.H.
Tucked among Newport, R.I.'s many historic homes is the Lucas-Johnston house. The house was originally owned by Augustus Lucas, who arrived in Newport from France around 1700 and grew wealthy trading in slaves. Lucas' grandson Augustus Johnston gave the house greater renown when he lived in it. Johnston was a British official who accepted a position as Newport's stamp agent – in charge of administering the Stamp Act. As in Massachusetts, Rhode Island agitators protested vehemently against the Stamp Act. Johnston was hanged in effigy, and a mob drove him from his home into hiding until he agreed not to serve as stamp agent. In July of 1776 Johnston again ran into difficulty when he refused to swear allegiance to the revolutionary cause. For that, he was imprisoned for a time. When the British held Newport during the early days of the war, Johnston served in various capacities in the city. When the British left, Johnston left with them. His house was confiscated. A good part of Johnston's life was spent arguing for compensation for his losses due to both the Stamp Act riot and the American Revolutionary War. Today the Lucas-Johnston House is privately owned. 40 Division St., Newport, R.I. In July 1777 Vermont's Col. William Marsh made a difficult decision. When the American Revolution broke out, Marsh had joined forces with the Green Mountain Boys. But he decided to switch sides and become a supporter of the Loyalist cause. Marsh came to Vermont from Connecticut via New York and settled in Manchester around 1765. When war broke out he was given the rank of colonel with the Green Mountain Boys. But by 1777 he had grown uneasy by the way the Patriots were harassing Loyalist Vermonters, and that prompted him to join forces with British General John Burgoyne. Following Burgoyne's defeat in Saratoga, Marsh was allowed to return to visit family in Dorset, Vt. before his exile to Canada. During the war he acted as a diplomatic adviser and spy handler for the British. He actively lobbied to have Vermont switch sides and join with Britain. Marsh's Manchester property was confiscated and sold by the Vermont government. Marsh always retained hope that he could recover some of his property, but it did not happen. 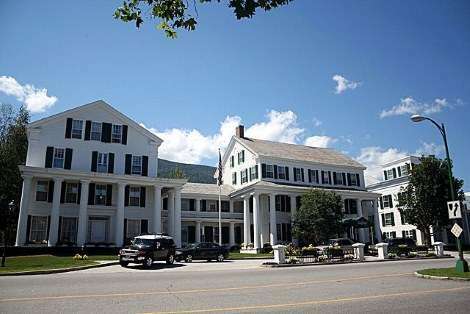 His name lives on, however, at the Equinox Golf Resort and Spa in Manchester where visitors can dine in the historic Marsh Tavern. 3567 Main St, Manchester, Vt. Images: Lucas Johnston House By Swampyank at English Wikipedia, CC BY 3.0, https://commons.wikimedia.org/w/index.php?curid=20434670; Equinox Hotel By Rolf Müller (User:Rolfmueller) - Own work, CC BY-SA 3.0, https://commons.wikimedia.org/w/index.php?curid=1352242. My family, Adams’, fled Boston during Revolution and remained loyal to England. They were given land on Deer Island in the Bay of Fundy (I hope I got that right) New Brunswick, Canada. Eventually they made their way back to the U.S.A Through Eastport, Maine and settle in parts of Maine and Massachusetts. Did the Equinox have anything to do with Marsh? You’ve merely presented a tale of naming a tavern for him. No ownership history? The hotel has a much more storied history, including the summering of Mary Lincoln & son Robert in 1864. Had A. Lincoln survived, a vacation at the Equinox was planned for 1865.